For over 25-years, Rain Master is and has been dedicated to providing state of the art water management solutions thru the use of a wide range of central control systems and communications technologies. Rain Master was first to introduce an Internet based, wireless, "Smart" ET/Weather Based irrigation controller with two way communication and "Smart Alerts™. With hundreds of installations across the US, water savings have been reported in excess of 25% using ET/Weather Based controllers. Irrigation central control systems, controllers and handheld remotes exceed irrigation industry quality and performance standards. 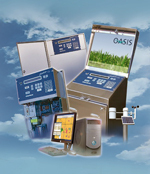 OASIS is the next generation of Central Irrigation Water Management; featuring Windows® drop down menus, Visual Positioning, graphical presentation, and mapping. VP mapping tools provide an easy way to locate and program infield controllers (DX2), weather stations or other devices using "zoom" features. Highlight any DX2 controller and launch programming screens, view alerts, or use the integrated note pad. Realizing that the true successes of any product are the people who support it, Rain Master prides itself in having the highest quality sales and technical support personnel in the irrigation industry. With over 200 years of combined irrigation and water management experience, Rain Master customers' are assured the highest level of straightforward cost effective solutions, service and support. 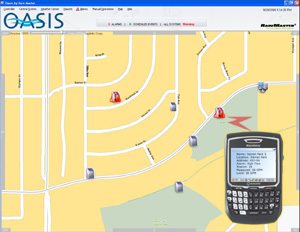 The OASIS Central Control System provides the same consistency and "backwards compatibility" with previous releases of DX2 hardware, as well as being committed to providing the latest in software and communication technologies. By offering the widest selection of options, there isn't any communication obstacle that Rain Master cannot overcome.